There can be few employees or managers who are surprised that the annual appraisal approach is itself under review. Business objectives change throughout the year, and employees need to adapt to new goals and new directions. The move towards Continuous Performance Management is long overdue - and its principles are being adopted by companies large and small. But what is Continuous Performance Management? Continuous Performance Management is the regular, on-going, one-to-one performance conversations between manager and team member - that takes place throughout the year rather than the more traditional annual appraisal. Managers and team members get to monitor the progress of objectives and goals and can take action when needed should things go off track. Real-time feedback and coaching can be given rather than waiting for the end of the year! Longer-term objectives can be broken down into more near-term goals. But is this anything new? For those managers who have always had regular check-ins and catch-ups with their teams, they'll be wondering what all the fuss is about. After all, this is simply business as usual. But for those more used to the uphill struggle at the end of the year to remember what has happened, rooting around to gather evidence and reviewing objectives which may have, quite frankly, been surpassed by others during the year, moving to a more agile approach to performance management, could be a new way of working. Making the move towards a slicker, more agile, personalised and informal approach. There have been numerous, well-publicised examples of large organisations moving away from the annual review; Adobe, Deloitte, Gap and so on. But Continuous Performance Management is not the domain of the large corporate. At Head Light we're also working with far smaller-sized businesses to help them get the benefit of this more continuous approach. You can read about how the UK operation of the Munoz Group in the UK have implement continuous performance management and have witnessed stronger individual engagement with objectives. 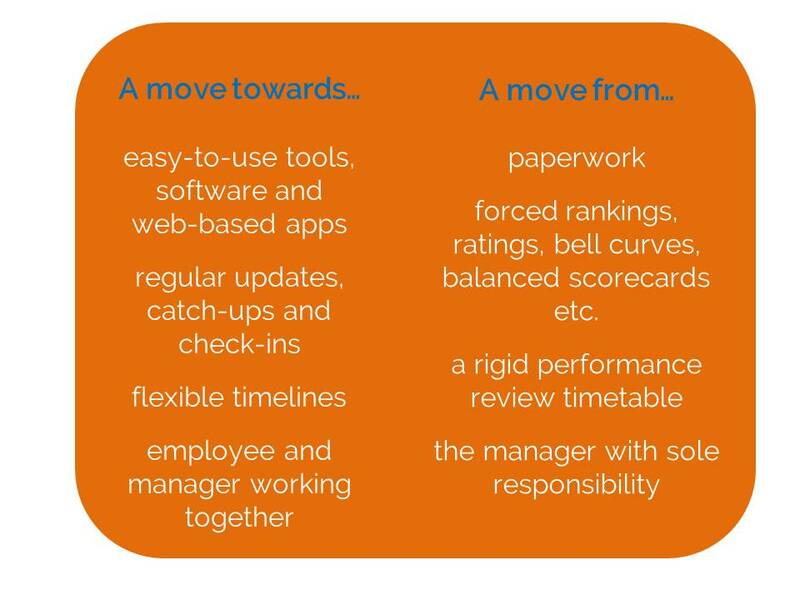 When you are ready to work through how you can shift your annual appraisal approach, then work through our online Guide. Read more about how to transition to Continuous Performance Management. And, when you're ready and think it useful to see our Talent Performance software for yourself, then get in touch for a demo.